Drum Equipment Rental Services & Onsite Demonstrations-Buffalo Grove, Illinois-Liftomatic Material Handling Inc.
Liftomatic Material Handling, Inc. is proud to offer our customers equipment rental program on weekly basis. This rental program is designed to meet our customers' short-term drum handling needs. All rentals are scheduled for a specified amount of time and terms are noted on the rental agreement and purchase order. Should the rental period unexpectedly need to be extended, you must get an authorization from Liftomatic Material Handling, Inc. so as not to interfere with existing rental schedules. If you would like to purchase the equipment at the end of the rental period, please contact Liftomatic Material Handling, Inc. for pricing and availability information. The party renting the equipment is responsible for freight charges from and to our Buffalo Grove, IL facility. Call us for information on any rental program Toll Free at 800.837.6540. Thank You! * All rental charges are due 10 days from the end of the rental period. *Rentals are calculated on a weekly basis. No daily rentals available. The best place to see how Liftomatic Material Handling, Inc. products solve your drum handling problems is in your plant. 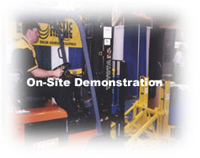 Call or Email us to arrange an in-plant demonstration. We'll make the necessary arrangements. Call Toll Free at 800.837.6540. Do you have a date or time frame in mind for a demonstration? Liftomatic Material Handling, Inc. is proud to offer our customers a cutting edge, innovative, "no obligation" equipment trial for up to ten days (dependent on models and availability) when they issue a purchase order for any new Liftomatic Material Handling, Inc. unit. The trial policy is to ensure that our customers have ordered the correct Liftomatic Material Handling, Inc. equipment to meet their drum handling requirements, thus avoiding unnecessary restocking charges. We want the fit to be right the first time! The trial period begins the day the equipment is received at your facility. Presuming the equipment works as planned in your routines, and you decide to keep it, please pay the invoice amount in full. If for some reason the equipment must be returned, it should be in good condition, and must be returned not more than 7 days after the end of trial period. A credit will be applied to your account upon receipt of the returned unit. Should the equipment not be returned at the end of 10 working days, a $200.00 per week fee will be assessed onto your account until the equipment is returned. No returns are allowed after 30 days from the end of the trial period. The party ordering the trial equipment is responsible for freight charges from and to our Buffalo Grove, Illinois facility.